my favorite face masks — Powell & Co.
Not so long ago, I talked about how I changed up my skin routine. That regimen has got me feeling great about my skin lately and I find myself using less and less makeup, especially now that I treat my skin to a face mask a few times a week. There are so many face mask products out there, it can be super overwhelming to find the right one for you. In this post, I share my favorite face masks at all levels of investment. It all started with my Busy Philipps obsession (seriously, she's a goddess). I'm trying to be more like her in a lot of areas in my life. I mean, she was Kim Kelly in Freaks & Geeks .. #QUEEN. If you aren't familiar with her, she is pretty amazing + is a fellow face mask enthusiast. She posts Instagram stories all the time about her face masks, so of course I had to give some of her favorites a try (I credit her with the Dr. Jart masks in my collection). The good news is, you don't have to spend a ton of money to get a great face mask. Although, there are some that are totalllyyy worth the splurge (the one in the photo is pretty pricey, but so amazing!). I've picked a few of my absolute favorites below. This one is definitely a splurge, but I got a sample size in my BirchBox that has lasted me quite some time. This mask feels so luxurious! Plus there's something about a green mask that just feels so right. I love how this mask tightens my face and leaves my skin unbelievably smooth. Vegan and cruelty-free + they make my face feel amazing and hydrated. Additionally, they are super affordable. I first started using ACURE products through my Grove Collaborative membership. I have never been disappointed by their products. This mask will last you forever + leave your face looking and feeling fresh. Variety is the spice of life, right? This is such a great deal on some AMAZING face masks. I love Dr. Jart products and if these are good enough for my girl Busy, they are certainly good enough for me. I especially love the Brightening Solution. 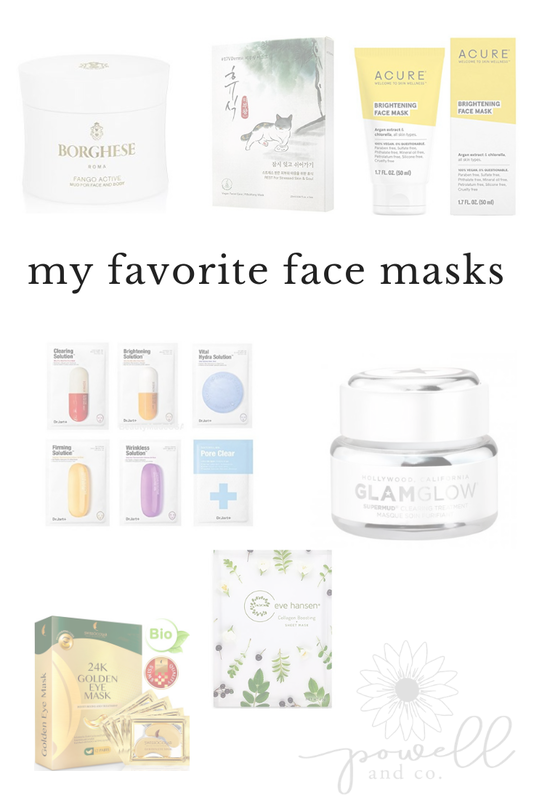 These are my ride-or-die, bff, best ever, most favorite masks. They are only for the under-eye area, which is my biggest problem spot. These are SUCH a good deal, come in packs of twelve, and are the perfect addition to my morning commute. I put these on my face in the morning and let them do their thing while I drive to work. I feel refreshed and look a lot less like a zombie once I get there. Seriously, if you try nothing else, TRY THESE. These work like a charm! They smell great, feel great, and leave my skin looking youthful and hydrated. They are a great deal, too. What face masks do you love? Let me know in the comments below or tell me on Instagram!